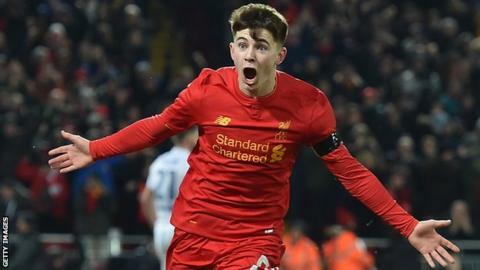 Liverpool teenager Ben Woodburn must be capped by Wales against Republic of Ireland to tie him to the national team, Dean Saunders says. Nottingham-born Woodburn, 17, received a first squad call up for the World Cup qualifier on Friday, 24 March. Wales boss Chris Coleman has rejected suggestions that Woodburn being eligible for England was a factor in the player's call-up. "I don't know why Chris is denying it," said former Wales striker Saunders. "You can't buy or sell players and we're only a small country. "If someone is eligible for us and there's a bit of potential there then he's (Coleman) done the right thing. "He's Welsh and he's playing for us. It's good news for the squad." Woodburn is eligible for Wales through his maternal grandfather and has already played at under-16, under-18 and under-19 level. The forward has made seven appearances for Liverpool this season and become the youngest scorer in the club's history with a goal against Leeds United in the EFL Cup in November. "He's got a good attitude and nothing fazes him. Top players have that sort of attitude about them," former Liverpool striker Saunders told BBC Radio Wales Sport. "He doesn't look like a rabbit in headlights when he plays for Liverpool. He's a talented player and scores goals." Wales are third in Group D, four points behind Martin O'Neill's Republic of Ireland, who are top and Coleman said Woodburn's inclusion is not a spur of the moment decision. "He's been in our system for five years, so we know all about him," Coleman said. "He's done well this season. We are looking forward to having him on board"
"If we want to put him on for tactical reasons, it would be for that, but not because we are worried about anyone else looking at him."